Friends. I said I would announce the winner yesterday, but I was busy hunting for apartments instead! Ack! So. I’m late. My sincere apologies. The winner, thanks to random.org, is Miri! 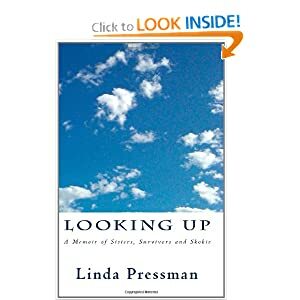 Send me your address (at hereeverymomentcounts [at] gmail [dot] com) and I will send you a copy of Looking Up: A Memoir of Sisters, Survivors, and Skokie. For the rest of you, I strongly encourage you to read this book. It’s available on Kindle and in paperback at stores everywhere. I start school on Monday. I read the syllabi of my classes last night and am already 7 chapters, 2 papers and several little essays behind. In between hyperventilating sessions, I remembered that I’m starting a master’s program and must start acting, thinking, and writing like an intelligent person. And since Ben and I like having big changes all at once, we will also be moving next weekend (if things go as planned), and he starts his new job the following Monday. Thank goodness I still have 5.5 months until baby #3 is due. So I will all but disappear from this space for the next little while as we adjust to, well, everything. Wish me luck! While reading this book, I found that her parents’ stories, and her stories, could also be my stories. For example, she talks of her grandma who had multiple children born without rectums and passing away. I read this with tears pouring down my face as I thought of my own children who didn’t survive the embryonic stage. Linda, the 6th of 7 sisters, also talks of she and her sisters trying to find their place in their family. Some have an easier time of it and others may never find it. As the second of ten, I understand the difficulties of figuring out who you are and where you belong in your family. Yet, like Linda, I have deep love and respect for all my siblings. Expertly and artistically tying in her parents’ and grandparents’ Holocaust stories to her own growing up experiences, Linda made me feel like I was in her house as her mother chastised them for complaining about food and clothes by comparing her meager existence in the forest to their current living situations. I was a guest at the many family functions, listening with growing boredom to my the stories of my grandparents and thinking that every family had Holocaust stories. And I was with her as they moved away from the Skokie home. Through it all, many of her family left their religion. Linda, on the other hand, found strength and courage in her Jewish faith and continues to talk about her rich heritage and traditions on her blog, Barmitzvahzilla. She gives me hope as I figure out my own spiritual journey while I consider how my grandparents’ and parents’ stories impacted how I live. Linda’s book is available at bookstores – on-line and otherwise – and I promise it will be an excellent addition to your library. As a special treat, I am giving away a free copy. Just leave a comment telling me how your parents and/or grandparents shaped your upbringing and I will randomly select the winner. If you would like additional entries, “like” Linda’s page and my blog’s page on Facebook. Entries will close on Mar. 9 at 12 pm. Until then, happy reading! *I was given a free copy of this book but did the review because I loved it so very much. I know you will too. The Road Show. A book about five different people–each struggling with something–who participate in their ward’s Road Show for various reasons. Braden Bell, a father who followed his dream to write a book, is a masterful writer. His book has a surprising depth that leaves the reader feeling breathless. This has already become one of my comfort books. You know, the type you seek out when you have had a bad day or a day when you just need to relax and read something you know you’ll enjoy. The characters are not only believable, but people that I both hated and loved at the same time–a sure sign of remarkable writing. As I was introduced to each character, I could vividly picture them. They were my neighbors, friends, family, and me. An accurate portrayal of a Mormon’s unique congregation. I don’t usually prefer LDS literature, but this book is different. It is real, believable, and poignant. I cried, I laughed, and I pondered. A beautiful book about sin and redemption. I have come to know Braden through his blog. His compassion intrigued me; his writing superb; he unknowingly convinced me to pre-order his book. My judgement was sure as this book was evidence of the talent I had seen on Braden’s blog. I look forward to reading more of his novels.